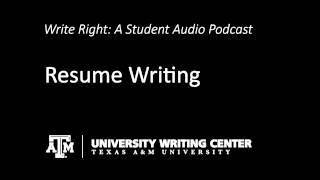 MEGHAN: Good Morning my fellow Aggies and welcome to “Write Right,” the University Writing Center’s student podcast. I’m your host Meghan Wall and in today’s episode we’ll be taking you on a crash course in resume writing. Why is writing a resume so important, because, in today’s competitive job market your resume is a critical marketing tool. A good resume will set you apart from the crowd of college graduates that flood the job market every year. To help us understand how to better write a resume, Stan and Mandy are here from the Career Center with all the tips we need. So listen up because in no time you too will be able to create a unique, professional, and enticing resume and successfully launch your career. STAN: Good morning students I’m Stan from the Career Center. STAN: And we’re here to help you write a resume. MANDY: Now I know all of you are just itching to sit down and start writing up that resume. MANDY: But hold on, first you must determine your purpose. That purpose should be to sell yourself, not by telling your life story, but by pertinent, unique details that make you stand out. TAMMY: Oh yeah like being pretty! RICK: Well I totally think like being able to chug a gallon of milk in 12 minutes makes me stand out. STAN: That’s good son but better make sure the skills and accomplishments you’re listing relate to the job that you are applying for. CINDY: How do we know what kind of skills to put down? MANDY: Well you can start by doing your research. Find out the mission statement of the company that you are applying for and what their company goals are. Better yet, talk to someone within the company if you can. You should gear your resume specifically for the job that you applying for instead of just giving out a generic resume. CINDY: So what should my resume look like? STAN: Well the appearance should be clean, simple and professional, but it should also be a reflection of you. Some basic guidelines that we tell people are: as an undergrad or recent graduate you probably only need 1 page; use a basic font that is easy to read such as Times New Roman or Arial; keep it simple don’t overuse italics, bold, or underline; divide your page into separate sections: personal data, educational background, leadership experience, work experience, activities, and skills; include an objective and references if specified. MANDY: We’re going to walk you through each section one-by-one and answer all of the questions. First we’re going to start with the personal data section. TAMMY: Oh I love the personals! Well I guess I should put that I’m 5’7”, curvy, I love dogs, and I’m single and ready to mingle. RICK: Tammy, your future employer doesn’t need to everything that’s on your Facebook profile. MANDY: Typically, Tammy this information goes at the top of your resume. You should use your full name, current and permanent addresses, telephone number, and the email you can be reached at. Often the name is centered at the top or put in a larger font such as 12-14pt or bolded. TAMMY: So what font size should the rest of the resume be in? CINDY: Duh…Rick, it’s easy, the objective just states what you are wanting from the company. MANDY- That’s right Cindy. You don’t have to have one though. It’s good if you know exactly what specific job you want, otherwise that information can go in the cover letter. Now, on to the education section… Here’s what you should include in this section, starting with your most recent education: first, the name and location, city and state, of the college or university; second, degree received along with major and minor; third, graduation date including month and year or expected graduation date, and fourth, your GPA. RICK: Well my GPA isn’t that good, it’s a 2.3, and so should I just leave it off? STAN: Well Rick, It’s a good idea to include your GPA even if it’s not the most impressive aspect of your resume. If a job only wants people with 3.5 and above it’s better that you find out sooner rather than later their requirements so that no one is wasting their time. JOE: Well I did really well within my major of computer engineering graphically designing video games, but those weed out courses my freshman year really brought down my cumulative GPA, what should I do? MANDY: In that case you can just put your Major GPA if you want. RICK: Well I did my first two years at Blinn before I came to A&M there I had a 4.0, so can I just show that? STAN: Well Rick, its fine to include your GPA from that school as long as you completed at least 30 hours there. TAMMY: Well I’ve taken a lot of different types of classes that have given me experience I could use in a new job. How can I include those? MANDY: It’s okay to include between 4-6 relevant courses that your employer may not have known about especially if they are relevant to a new job. STAN: And one other thing for the education section: I’m sure that some of you are paying for your own school or have at least half of it being funded either through scholarships, grants, or loans. If so include this on your resume because it can show your academic excellence, determination, and work ethic. Also, if you’ve ever made the Dean’s list, or have a class rank, any awards, or scholarships you can put those in a separate Honor’s category. MANDY: Alright guys enough with education, lets move on to the work experience section. In this section you want to list your full time and part time positions, internships, or co-op jobs. You should start with the most relevant job and then put the rest in order from most recent to least recent. Include the job title, company or organization name, city and state of location, and dates of employment. STAN: Now under the job title you want to briefly describe your duties at the job. When doing this, use short phrases instead of complete sentences and begin each phrase with an action verb. The types of action verbs you use can be categorized into three groups: how you interact with people, things, and ideas. Luckily for you guys we brought in Action Verb AL the singing chipmunk to explain this better. ACTION VERB AL: Hey kids I’m Action Verb AL. [singing] Well if you dealt with people use words like: administered, advised, analyzed, arranged, assisted, collaborated. RICK: So if I worked at country club as a cart boy I could say: managed course operations including greeting customers and parking carts. ACTION VERB AL: Yes! [singing] But if you dealt with things use words like: compiled, completed, constructed, created, designed. TAMMY: So if I was a waitress at a restaurant I could say: facilitated sales and generated revenue? ACTION VERB AL: Uh huh! [singing] And if you dealt with ideas use words like: devised, implemented, integrated, maintained, modified. JOE: And since I was head of my guild in World of War Craft I’m qualified as a network manager? STAN: That’s right son, thanks AL! MANDY: Do any of you have any questions so far? CINDY: Well what if I don’t have any actual work experience to put down? It’s just that I haven’t had time for a real job with taking 17 hrs, doing Fish Camp, student council, and my sorority. MANDY: Well Cindy, I‘m glad you asked that because leadership experience is what we were going to talk about next. Leadership, responsibility, teamwork, and organization are all important qualities that employers are looking for, and those can be gained from organizations too. STAN: In your case Cindy, you should put most of your emphasis on the leadership section of your resume. Here you can include the professional affiliations, clubs, organizations, and campus activities that you played a leadership role in. Be sure to put down the name of the organization, dates of involvement, and any offices you held or committees you chaired. As with the work experience section describe your duties and responsibilities within the organization using action verbs. CINDY: Oh I have lots of activities! I run 2 miles every Monday and Wednesday, get my nails done every other Saturday, and tan on Tuesdays! RICK: Cindy I don’t think a job wants to hear about your weekly beauty routine. MANDY: You’re right Rick, sorry Tammy, while those are activities we’re looking more for organizations or groups that you were a member of or helped out with but did not have a leadership role. JOE: What if I don’t even have any good skills. You know, like numchuck skills, bow hunting skills, computer hacking skills; oh I’ve got those but yea. STAN: This just in recent statistics show that the top 10 qualities employers seek are: Drum roll please? MANDY: A strong work ethic. RICK: So like what if I have other stuff that won’t fit in the categories but I still want to put on there, what do I do? STAN: Ha ha, calm down, I didn’t forget. Sometimes you need an extra category for random other stuff. Go ahead and create this, and include any studies or travels abroad, military experience, publications and presentations, relevant projects completed, special training, licensure or certifications. You can label it accordingly. MANDY: Well that’s it, any questions? TAMMY: Hey did you get all that? CINDY: what did she say? RICK: [yawn] Ohh…I just woke up!